The best writer alive today. - a sentiment echoed by other influential authors and readers. Many have listed him as inspiration, and yet if you look on Amazon you will see many one and two star reviews for his finest works — including The Book of the New Sun, which was voted third all-time best fantasy novel by Locus subscribers back in 1998. Wolfe has won some of the genre's most prestigious awards including the Locus Award six times, the Nebula twice, the August Derleth Award, the Campbell Award, the BSFA, the World Fantasy Award four times and to top all that the World Fantasy Award for Life Achievement in 1996. Novels in the Book of the New Sun series have won the British Science Fiction award, the World fantasy award, the Locus (twice), the Campbell Memorial award and the British Fantasy award. So why does such an incredibly talented author get such mixed exposure? I think part of that answer lies in the way he writes. His books require undivided attention and eschew the lazy and casual reader. They are often filled with obscure English which even those with a commanding vocabulary won't always recognise. On the surface they employ the standard, overused trappings of genre, robots, dragons, medieval kingdoms and such — putting off those snooty readers that "won't read fantasy". They do however reward the attentive, the patient reader who is looking for something more than a quick fix. They have more depth than Loch Ness and if you've only read the story once you haven't read it all. 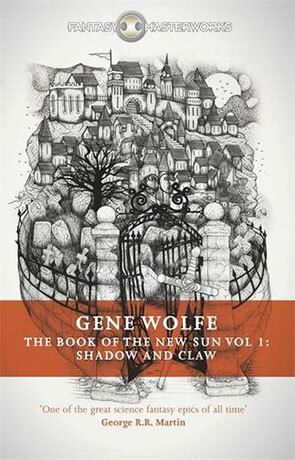 Such is the case with The Book of the New Sun, it is Wolfe's opus, a tetralogy that Gollancz has gladly made a part of their Fantasy Masterworks, combined in two parts — Shadow and Claw and Sword and Citadel. This review concerns the first, itself combining the novels The Shadow of the Torturer and The Claw of the Conciliator. Set a million years in the future on an "Urth" that is vastly changed, the story follows the path of Severian — an exiled torturer who made the unforgivable mistake of falling in love with one of his victims. He must journey to the distant city of Thrax, armed with the ancient sword Terminus Est. For Severian this means leaving the only place he has ever known. A journey of discovery for Severian as much as the reader. It's within the first person narration where the authors genius shines. Its a masterpiece on the unreliable narrator and shows the world in realistic shades of grey where little can be taken at face value. It's also a lesson about memory, how our own mind can trick us into remembering falsely — or those can choose to remember them falsely, how opinion alters perception and how two people can see the same thing very differently. Sprinkled throughout are little references to our own world, most striking a scene that describes a "knight" with a gold visor and strange stiff banner starring out across a desolate desert — recognisable as a picture of an astronaut on the moon. It's also a welcome departure from a tolkienesque world and couldn't be much further from Lords and their rings. The Book of the New Sun: Shadow and Claw is evocative, compelling and unique. It isn't a novel you can skim or glance through, it does however massively reward the attentive reader — simply a masterpiece of literature. Written on 1st June 2015 by Ant.